Is table tennis an all weather sport? Well, table tennis is an Olympic Sport which is played to a very high standard by professional table tennis players. But it's also played by millions of other people all around the world ... from nationally registered players to keen amateurs to purely recreational players. Table tennis is very adaptable, so it can be played in a variety of places, unlike many others sports (imagine trying to play squash outdoors!). Indeed, one of the best things about table tennis is that it can be played almost anywhere. So can you play this great sport outdoors? Although table tennis is generally played indoors, you can also play the game outdoors. However, to play outdoor table tennis successfully, you'll need the right weather conditions. Firstly, it needs to be dry - but just as important, it mustn't be windy as this will affect the flight of the ball. Windy conditions will also cause debris to be blown onto the table surface which can impede the bounce of the ball and potentially spoil your enjoyment of the game. 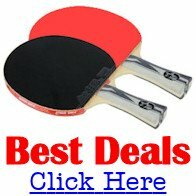 Table tennis tables are available in many different styles, but if you're going to play outdoors all the time, you'll need a table that's specifically designed for outdoor use. 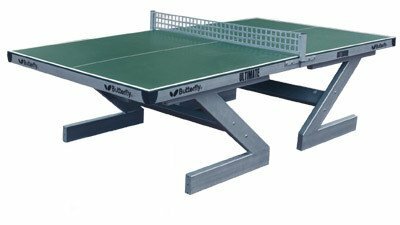 The best models of outdoor table tennis tables have galvanised steel undercarriage, net and posts, and a weatherproof top surface - like this example from Butterfly. But if you want the most durable, weatherproof outdoor table available, then you'll need concrete table tennis tables. So what else do you need to look out for? If you use a table tennis table outdoors which is designed for indoor use, you run the risk of the table top warping. Indeed, the warping of table tennis table tops is a common problem. Direct sunlight and rain will easily cause warping, so you need to use a table which is designed to resist water and temperature extremes. Additionally, you need to be aware of the size of a table tennis table. Is it a full sized table? You should also consider the durability and stability of the table, and whether it includes a weatherproof net and posts. You can use an indoor table outdoors, but you'll need to move it back inside after you've finished playing, otherwise it will probably warp the playing surface. Therefore I wouldn't recommend a table designed for indoor use be used outside on a regular basis. Indoor tables have a much better playing surface than tables designed for outdoor use ... but if you're just playing for fun, an outdoor table can be great fun. What's the difference between an indoor and outdoor table? What type of undercarriage do you need? What type of table top surface is best? Who are the table manufacturers and which tables authorised by the ITTF?